The Flume Creek Canyon trail is located in the Pollock/Flume Canyon Area of the McInnis Canyons National Recreation Area near Grand Junction and Fruita, Colorado. The trail begins off of the Flume Canyon F1 trail and follows a branch of Flume Creek through a narrow canyon where the trail comes to an end beneath a big spillover. Care should be taken to avoid the canyon during periods of heavy rain due to the danger of flash flooding. To get to the Pollock Canyon trailhead drive south out of Fruita toward the Colorado National Monument and turn west onto the Kingsview Road after crossing the Colorado River. The pavement ends after about a half mile. Follow the now gravel road for a couple of miles. 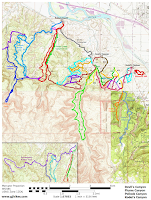 The Pollock Canyon trailhead is the last trailhead on the left and is hard to miss. From the parking area follow the markers for the F1 trail. Stay on the F1 trail as it travels around the side of the hill and drops in and out of the wash at the mouth of Flume Canyon. Continue as the the trail circles around and passed the turnoff of the P2 trail. From there the F1 trail drops down into the wash again. Just before climbing out of the wash watch for a side trail on the left. 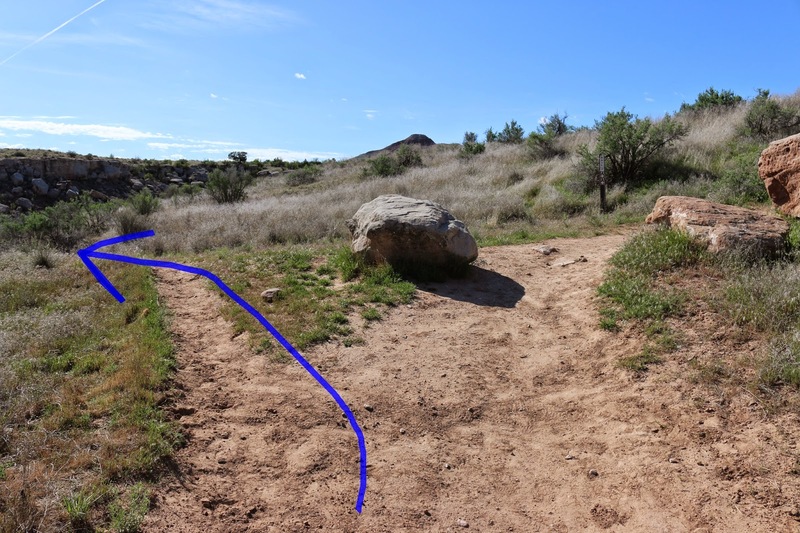 The trail has a brown mylar trail marker that doesn't have a name on it but it does indicate that the route is open to hiking only. This point is 6 tenths of a mile from the trailhead. The lower part of the canyon is choked with willows and tamarisk and can be a little hard to navigate if there is very much water present. At the time of this post some of the tamarisk were tagged for removal so conditions may improve in the near future. After the first quarter mile or so the canyon opens up a little and the hiking becomes a bit easier. 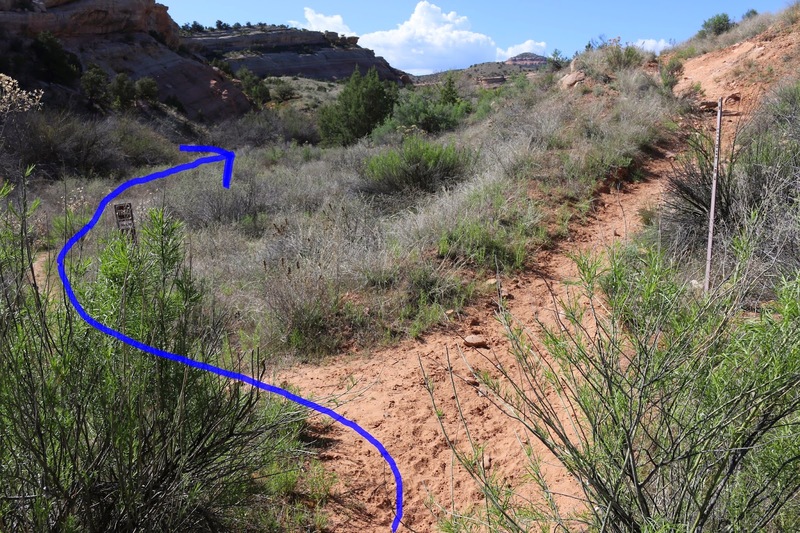 The trail transitions several times between areas of slickrock and rock benches with picturesque little potholes to sandy bottom stretches of trail. Further into the canyon the walls begin getting higher and higher. The hike comes to the turnaround point when it reaches an insurmountable spillover. It is hard to tell from this picture but the spillover is probably about 50 feet high. And just like any other sheltered place that has a little moisture always present there is usually some poison ivy growing. There isn't much here but it doesn't take much of it to remind you of your carelessness for the next week or so. 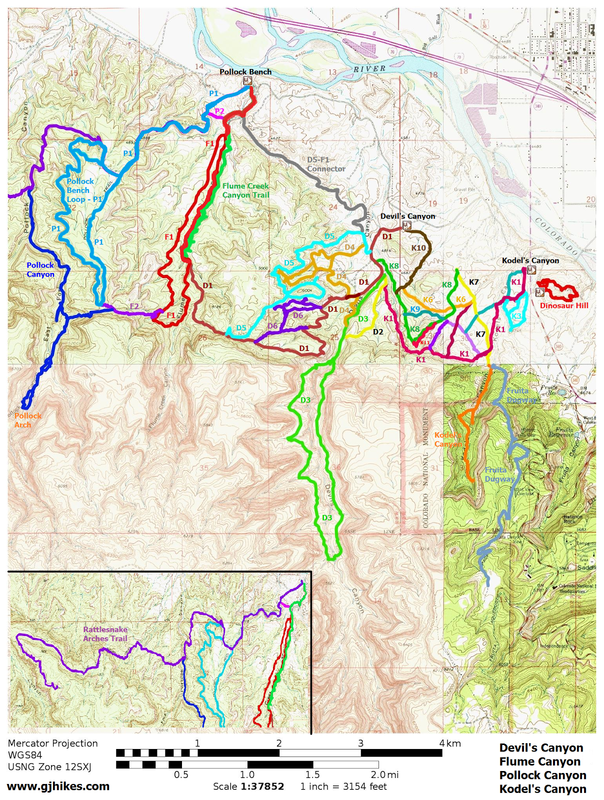 As can be seen from the map the east branch of the Flume Canyon trail travels right along the rim of Flume Creek Canyon. In several places there are trails that lead out of the creek bed and up to the F1 trail. One option on the hike out would be to take one of those trails and get back on the F1 a little early to avoid the congested mouth of the canyon. Flume Creek Canyon is a fun place to explore if you don't mind scrambling over a few obstacles here and there. Families with youngsters will need to help them along in a few places and be sure to watch out for the poison ivy at the spillover. That is the only place where we took note of any. If you watch the slideshow you will notice that we came across some wild turkey tracks. We have also seen a pair of golden eagles in the area on past hikes. If you would like to see it for yourself then all you have to do is 'Take a hike'.